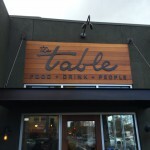 We went to The Table on a weekend walking trip to the Willow Glen neighborhood of San Jose when we were visiting Powell Sweet Shoppe. They are mainly a dinner place, but serve brunch on weekends, which is when we stopped by. Tables line the modern looking main dining area, with a couple of booths lining the outside edges. 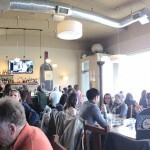 A full bar occupies the back of the restaurant, with an open kitchen to the left, giving it a “neighborhood restaurant” feel. The restaurant was very busy when we arrived around noon, and we were told the wait was going to be an hour or so. The Table has an electronic waiting list, so we were able to leave our SMS information to receive a text from the restaurant when a table opened up. This allowed us to to walk around “downtown” Willow Glen instead of being tethered within a few yards of the restaurant while waiting to be seated. We got a text a little over 30 minutes later and the hostess seated us promptly. 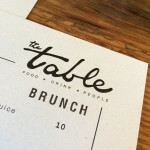 Brunch consisted of the restaurant’s take on breakfast classics such as French toast, pancakes, biscuits and gravy, and some lunch items such as sandwiches and salads. All the Yelp reviews mentioned The Table’s burger, so we were definitely going to try that. 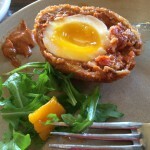 A couple unique items that caught our eye was the Scotch Egg and the Hangtown Fry. The Table’s take on Scotch Egg consisted of a soft yolk (as opposed to a hard boiled center) which added a nice textural contrast to the dish. The surrounding sausage was well seasoned and not overly powerful like your typical breakfast sausage (think Jimmy Dean), not greasy, and dare I say fairly “light” for something that is that is basically fatty ingredients that are then deep fried. 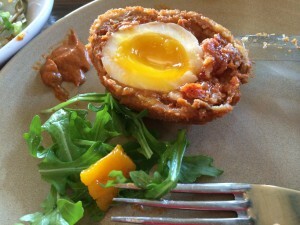 The accompanying arugula salad is a nice contrast and breaks up the richness of the dish. 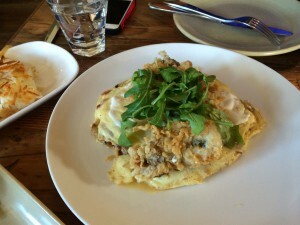 I did not know what to expect of the Hangtown Fry (traditionally, an omelet topped with oysters and bacon), and when it arrived table, it concerned me a bit because the fried oysters were sitting on top of a very “wet” looking omelet and topped with a dressed arugula salad. This usually means the crispness of the fried oysters languish the longer it sits so it’s a race to get them off before moisture ruins the dish. Surprisingly this was not the case. The oysters were fried just the right amount, maintaining the creamy consistency while balancing with a bit of crispness with the fried exterior. 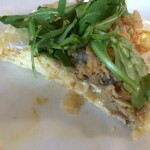 The bacon was incorporated into the underlying omelet and it somehow worked. 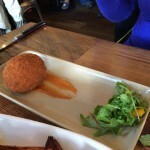 Another thing that surprised me was the hash brown/griddled potatoes that came on the side. Just looking at the them, they look just like any other shredded potato side dish that you could get at Denny’s or IHOP. But The Table added their own touch by shredding onion and fennel into the mix, giving it a nice flavor, making it a “keep coming back for more” rather than a “let’s just leave the rest on the table” side dish. 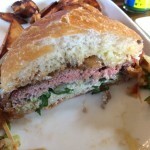 The burger has gotten a lot of rave reviews on Yelp, and I would agree. 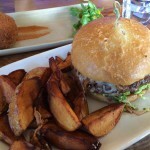 In terms of “upscale” or premium burgers, this one is pretty good and something I would order again. Entire burger was well balanced, with the richness of the meat and white cheddar cheese balanced out by the (I think homemade) pickles, spread, and sourdough-ish bun. The Table has a fresh take on some classic dishes. 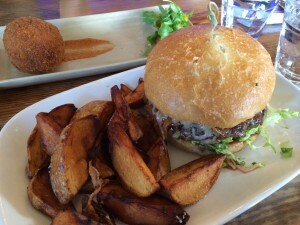 The neighbor-y atmosphere and friendly service contributed to a positive first experience. 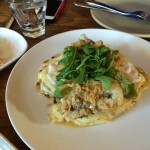 If dinner service is as good as brunch, I am excited about coming back to try their dinner menu. 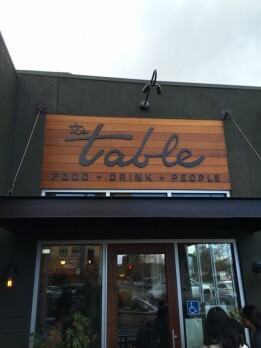 Definitely would recommend The Table for a casual, foodie dining experience.